Playing a potent mix of sleazy grunge and power pop perfection Mozes and the Firstborn hail from Eindhoven, The Netherlands. The band’s inspirations vary from Guided by Voices and Beck to Weezer and Nirvana. The past year Mozes and the Firstborn have been recording new tunes for their third full-length album Dadcore, due for release on January 25th 2019. 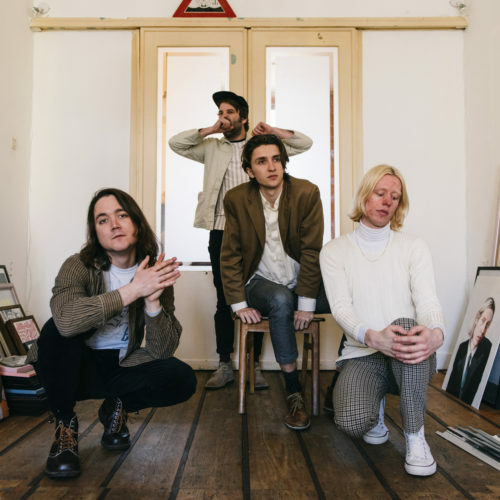 With ‘Dadcore’, Mozes and the Firstborn embrace this sentiment of looking back to what their dads listened to exploring their favourite styles within the paternal genre. The band present the record as a mixtape, a colourful collection of eclectic songs that they’ve hand chosen and want you to fall in love with and pick out your favourites, like any other mixtape. The band worked with a number of producers for this album, including producer/mixer Chris Coady (Beach House, Slowdive) and Roland Cosio (together PANGEA, Fuzz). In 2018 they have already released four singles: ‘Baldly‘, ‘Sad Supermarket Song’, ‘Hello’ and ‘If I’. The band started out in 2010 with Melle Dielesen on vocals, guitar and songwriting, Corto Blommaert on bass and Raven Aartsen on drums. Guitar player Ernst-Jan van Doorn joined them later. In 2011 they released their first EP I Got Skills, which title track rather fast became the fan’s favorite. The Californian label Burger Records released their self-titled debut album in 2014. Since then the band has embarked on international tours with The Growlers, Unknown Mortal Orchestra and together PANGEA, crisscrossing the United States and Europe. In 2016 the band released Great Pile of Nothing, a more introvert and mellow album. Mozes and the Firstborn released their third EP Marianne in 2017, followed by the Cassette Club EP a year later. This EP was released as a preparation of the Mozes Cassette Club. This is a ‘club’ for a limited number of members who get premium access on new tracks, demo’s and stories in the shape of a cassette. The latest singles of the new album Dadcore were also released on cassette for the Cassette Club.